I had a box of SOL Cuisine veggie breakfast patties and a block of the old standby Follow Your Heart Vegan Gourmet cheddar cheese in the refrigerator so I thought it would be fun to make a vegan version of a sausage, egg, and cheese breakfast sandwich. 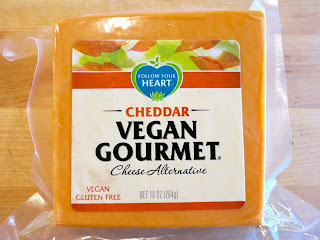 The Follow Your Heart Vegan Gourmet cheese was the best thing out there before Daiya and I still like the taste. It just doesn't melt as well as Daiya's shreds. I should note that Follow Your Heart just came out with their own shreds as well, which I haven't yet tried. 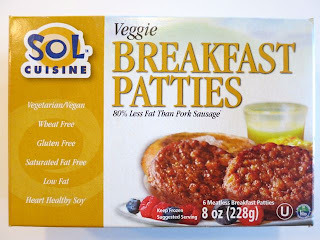 As far as SOL's veggie patties -- I really liked them. The texture and taste were very appealing. 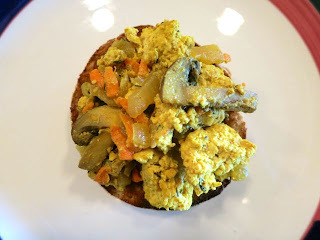 And on top of it, I made one of my favorite scrambled tofu recipes from Vegan With a Vengeance by Isa Chandra Moskowitz. 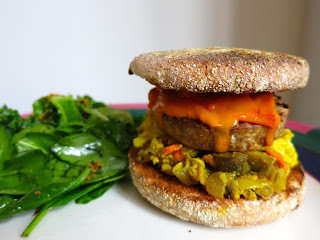 Take all that goodness and sandwich it between two whole wheat English muffins and you have yourself a breakfast/brunch crowd pleaser. Heat the oil in a skillet over medium-high heat. Saute the onions for 3 minutes, until softened. Add the mushrooms, saute for 5 minutes. Add the garlic, saute for 2 minutes. Add the spice blend and mix it up for 15 seconds or so. Add up to 1/4 cup water to deglaze the pan, scraping the bottom to get all the garlic and spices. Crumble in the tofu and mix well. Don't crush the tofu, just crumble it in your fingers. You want it to remain chunky. Let cook for about 15 minutes, stirring occasionally and adding splashes of water if necessary to keep it from sticking too much. Lower the heat a bit if you find that the tofu is sticking. Add the lemon juice. Add the nutritional yeast and mix it up. If the mixture is sticking to the pan, add splashes of water. The moistness really depends on how much water the tofu was retaining before you added it. 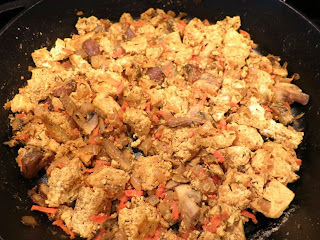 Fold the grated carrot into the tofu mixture. Keep warm. 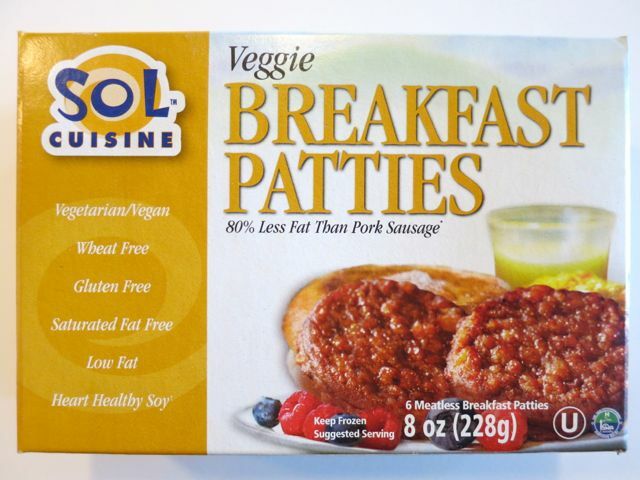 Heat the sausage patties as indicated by instructions either in a saute or grill pan. Heat the oven to 450-degrees. 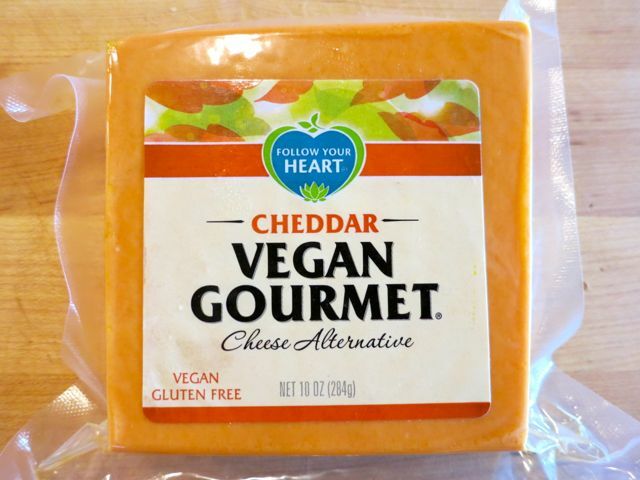 Place a sausage patty with a couple slices of cheese on top on a baking sheet and place it in the oven until the cheese melts. Be sure to keep an eye on it. Toast an English muffin. Then assemble by putting the scrambled tofu on top of one side of the English muffin. 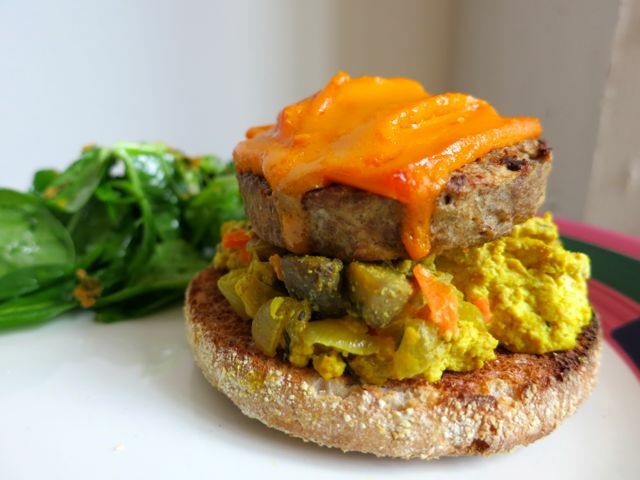 Then put the sausage and cheese on top with the other side of the muffin. Serve immediately. Thanks! I hope you try making this!